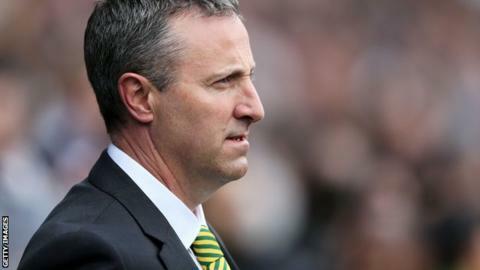 Norwich City boss Neil Adams has said his struggling side can respond to their 4-0 defeat by Manchester United. The Canaries are in the Premier League drop zone for the first time since early November and finish the season with games against Chelsea and Arsenal. "There are two massive, massive games and we need to take points from those games," Adams told BBC Radio Norfolk. "I can see character in the dressing room. There are people that are hurt by that performance on Saturday." Norwich, who have lost their last five games and scored just twice in that period, dropped into the bottom three on Sunday, with Sunderland going above them on goal difference after beating Cardiff. Adams was promoted from youth-team manager three weeks ago to replace former boss Chris Hughton, but the former midfielder has lost his three games in charge against Fulham, Liverpool and United. Their Premier League future rests on getting points from a trip to title-chasing Chelsea and a final-day visit of Arsenal, who are still yet to confirm their Champions League qualification. "What we have to do is to have character at Stamford Bridge and then again against Arsenal the following week," said 48-year-old Adams. "We have to make sure we are at it in these last two games. We knew the challenge before the Man United result. "We'd have liked to have gone into the next two games with a little bit more from Saturday's result. "But we'll be ready for it. We have to pick the players up and they have to pick themselves up. We have to give a good account of ourselves against Chelsea and Arsenal."